Setting up a stylish study spot for your student is made easy with the Amish Furniture Modesto Office Student Desk. This solid wood desk measures 48" wide and 26" deep, making it a great fit for a home office, bedroom, student dorm room or apartment. The simple classic elegance of mission style furniture blends seamlessly with traditional or contemporary decor, making it a longtime favorite for home furniture collections. The Modesto means business and offers one hanging file drawer for organization of important notes and assignments. There's one storage drawer and one central pencil drawer for writing tools. 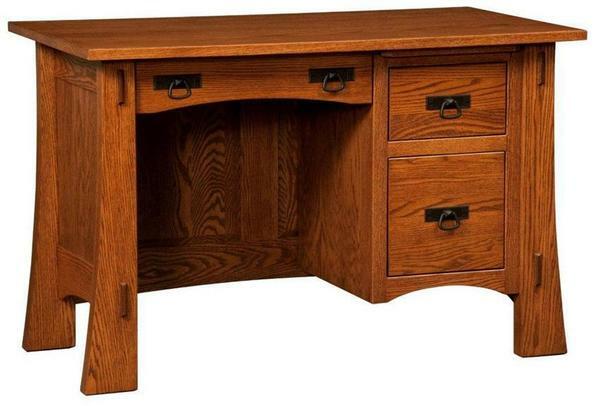 This Amish made desk is one that can serve many students throughout the years as it gets passed on to future generations. Handcrafted with premium quality materials in the USA. Email or call with any questions, toll-free 866-272-6773.